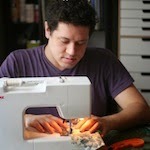 First thing's first, every Monday this year a new quilter will take over the 52Quilters blog, twitter, and instagram. Each week and each quilter will be unique in what they post and how they use the accounts, but they'll all introduce themselves here on the blog and use the platforms to give you a window into their lives. There will be a new quilter each week, but because the year starts on a Thursday, you've technically go me for a week-and-a-bit: I'll be posting until the 11th, with a new quilter taking over the on 12th. Just gives me time to work out the kinks and figure out how this is all going to work before I'm the first to pass the torch. Location: I live in London, England but will start tweeting from Toronto where I'm from and where I'm spending the holidays. Who I am and what I do: I've done a mix bag of things in my life, working as an educator in museums and galleries, and making, teaching and selling crafts in my spare time. Right now I'm trying to bring all my joys together by working on the Learning and Participation programme for the Crafts Council UK in London. I hail from Toronto, Canada but have been living in the UK for over nine years and love it. In addition to crafting and making I like cooking, travelling, walking and spending time with friends. Why I quilt: For a long time I thought of making as something that I wanted and/or chose to put my energy into, but in recent years I've realised its something that I need to do: something that fuels me: something I gain energy from. I learned quilting from my Great Aunt who made quilts for my family throughout my childhood, but never really did much of it as a child - in recent years I revisited quilting and discovered that it ticked a lot of creative boxes for me and I've been making quilts and teaching others to make quilts ever since! What fuels me: Mostly coffee, but also long quiet walks on my own or with friends. I'm an introvert/extrovert so I need balance spending time with people and having time to myself. Exploring places, taking photographs, seeing other people's work online, in galleries, shops, etc. gives me the inspiration I need to keep making. My favourite quilt is my first full-size quilt. 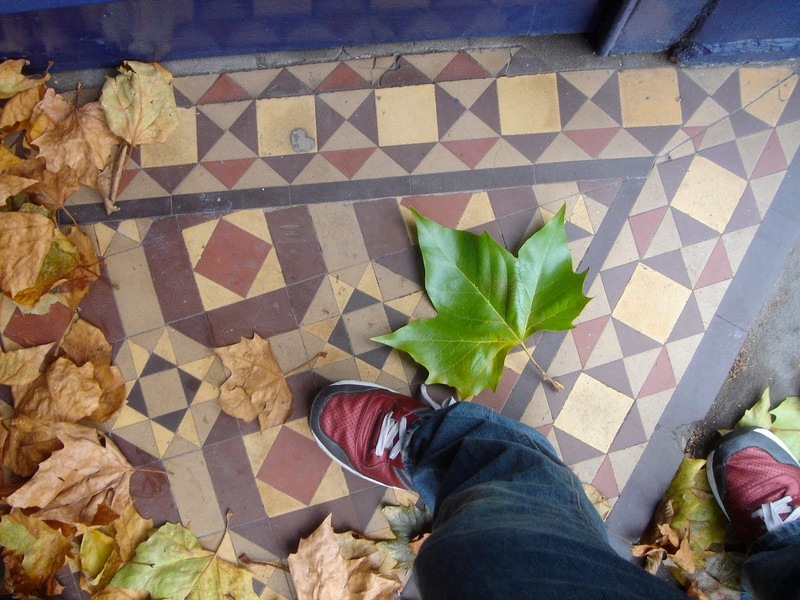 In 2005 when I first moved to England, I randomly took this photo and posted it to my blog to show off the size of the autumn leaves falling. My Great Aunt left a comment on the post and pointed out that the background looked a lot like a quilt. 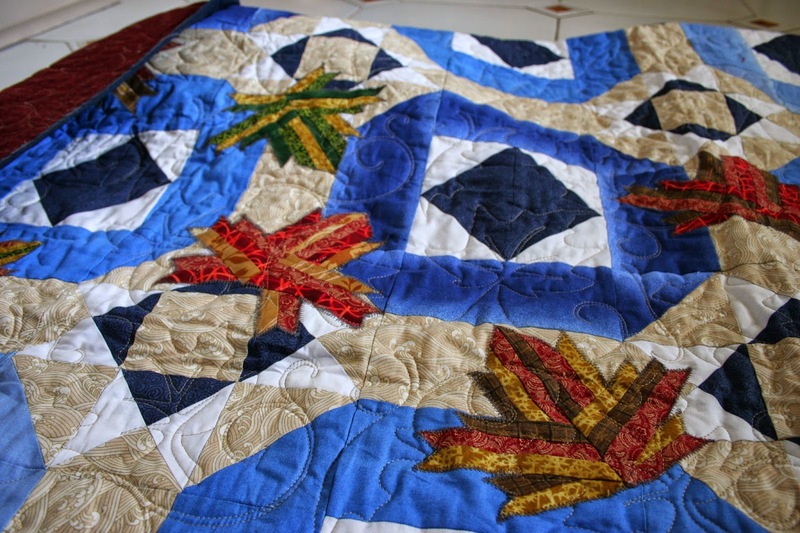 Years later, I was still thinking about the photo and about the idea of making a quilt that had maple leaves scattered across it. So I adapted the colours a bit to suit my friend's wedding colours and created this quilt as a wedding gift. The blocks echo the tiles in the photo and then I appliqued leaves on top. I was too scared to quilt it myself, so I sent it away to be long-arm quilted! It's my favourite quilt because I got to sit down with my Great Aunt and show her the finished quilt and talk about how I'd been inspired by her idea: It's was a really special moment for me because that was the last time I saw her before she passed away. Her work, patience and skill continue to inspire me today! So that's all about me. Stay tuned to the @52Quilters accounts for my posts over the next week-and-a-bit and check back here for more blog posts! Such a wonderful idea to build community, Chris. I especially enjoyed that you designed your first quilt rather than using a purchased pattern. Such bravery will lead to an exciting future. Congratulations. The quilt is beautiful! And the story that goes with it is so sweet. I'm looking forward to reading more! This is fascinating and I'm really excited about it. I only wish I had learned about it sooner, because I sure would have signed up! I'll keep checking for the next round! Also it was great reading about you. Great post Chris to kick off this project! Your first quilt is beautiful. Your Aunt was right. The background in the photograph of leaves does look like a quilt. I look forward to your next post. Great story and beautiful quilt. Very impressive that you designed your first on your own. Thanks for your wonderful comments, It's so great to see people excited and following the project. Makes me feel confident for when it comes to passing it on to the next 51 quilters!